When we were in Italy a few weeks ago we were staying at this hotel that featured a hip assortment of wine-driven cocktails. The host/bartender, Enzo, buzzed around the place and easily convinced guests to try the interesting drinks on the menu. One drink in particular caught my eye with its gorgeous orange color: The Aperol Spritz. Whereas a "white wine spritzer" in the United States often involves combining cheap white wine with Sprite or 7-Up, an Aperol Spritz is a combination of Proescco (an Italian sparkling white wine), Aperol (a unique bitter apertif), and soda water. See the recipe below. 3, 2, 1. Easy. It's relatively simple to capture the [gorgeous] color of Aperol in a photo. But describing its flavor is more difficult. While it looks like it's going to taste like some kind of creamsicle orange soda, it actually most notably imparts crisp grapefruit peel aromatics to the drink. On its own you'll detect a broader range of aromatics like sandalwood, and herb root. It's really intriguing stuff. 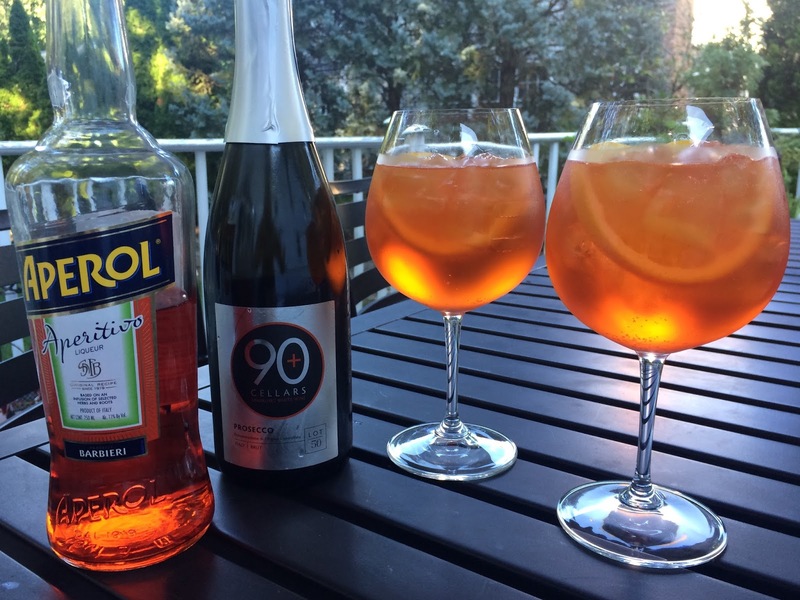 When combined with a fruity sparkling white wine like Prosecco and soda water in the right proportions, an Aperol Spritz is brilliantly refreshing summer treat. Aperol itself is 11% alcohol, which isn't too far off from the 11% Ninety+ Cellars Lot 50 Prosecco I enjoyed it with tonight. Poured over ice with some club soda and you've got a terrific low alcohol refreshing summer sipper. Aperol - looks like you can find it for around $20/btl at most liquor stores. I paid $28.99 at my nearest liquor store. Prosecco - any kind should do, within reason. I found the 90+ Cellars for $10.99 at my local grocery store. Club Soda - in Italy they used water that was carbonated with a device that added bubbles on the fly. Club soda should suffice. I guess you could make it with Sprite if you wanted it sweeter, but try it with Club soda first. Ice - get plenty of nice ice cubes unless you've got an ice making setup you're happy with. Orange - slices for garnish. Wine Glasses - or a big rocks glass. Black Straws - for optimal photogenic high style (I haven't got any yet). Don't overdo it with the Aperol. Although it looks great it can get too bitter. Make sure the Prosecco is well chilled.